Rear Living with Opposing Slides, Free Standing Dinette. Forest Floor Interior Decor. 1 Ton Towable at 11,571 lbs. Non-Bunk. Booth Dinette Front Double, Rear Bunks. Neutral Interior Decor. Mid Size SUV Towable at 3217 lbs. Bunks. Booth Dinette, Rear Bunks. Neutral Interior Decor. Mini Van/SUV Towable at 2694 lbs. Bunks. Booth Dinette, Front Queen. Neutral Interior Decor. Mini Van/SUV Towable at 2886 lbs. Non Bunk. Booth Dinette, Front Island Queen Bed. Neutral Interior Decor. Mid Size SUV Towable at 3277 lbs. Non-Bunk. Booth Dinette, Bunks. Neutral Interior Decor. Mid Size SUV Towable at 4608 lbs. Bunks. Front Booth Dinette. Neutral Interior Decor. SUV/Mini Van Towable at 2335 lbs. Non-Bunk. Free Standing Dinette, Rear Living. Twig Interior Decor. 1/2 Ton Towable at 7970 lbs. Non-Bunk. 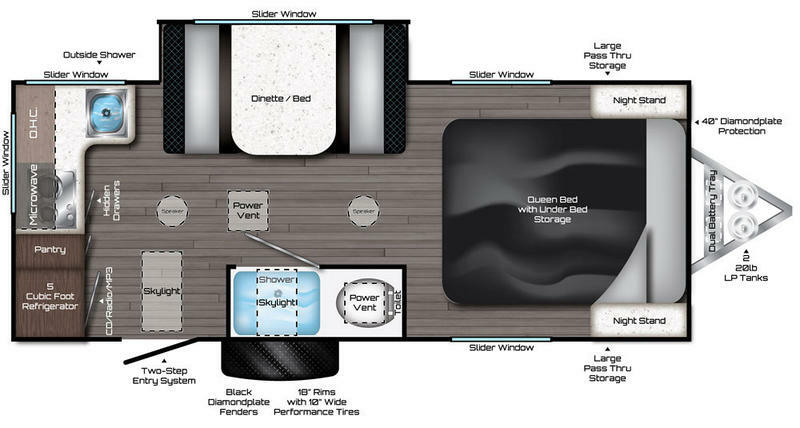 Rear Bunks, Booth Dinette, Tri-Fold Sleeper Sofa. Twig Interior Decor. 1/2 Ton Towable at 6870 lbs. Bunks. Booth Dinette, Rear Bunks. Twig Interior Decor. 1/2 Ton Towable at 8,155 lbs. Bunks. Rear Living w/Opposing Slides, Free Standing Dinette. Twig Interior Decor. 1/2 Ton Towable at 8890 lbs. Non-Bunk. Free Standing Dinette, Rear Living. Twig Interior Decor. 3/4 Ton Towable at 10640lbs. Non-Bunk. Rear Living w/Opposing Slides, Free Standing Dinette. Twig Interior Decor. 1/2 Ton Towable at 8720 lbs. Non-Bunk. Booth Dinette, Rear Bunk Room. Twig Interior Decor. 1 Ton Towable at 11,310 lbs. Bunks. Booth Dinette, Front Island Bed. Slate Decor. SUV/Mini Van Towable at 3425lbs. Non-Bunk. Sofa/Table Combo, Queen Bed. Shown in Russet Interior Decor. 1/2 Ton Towable at 3850 lbs. Non-Bunk. Booth Dinette, Rear Bunks. Russet Interior Decor. 1/2 Ton Towable at 5,263 lbs. Bunks. U-Shaped Dinette, Queen Bed. Brindle Interior Decor. 1/2 Ton Towable at 5638 lbs. Bunks. Free Standing Dinette, Front Living. Walnut Interior Decor. 1/2 Ton Towable at 7,906 lbs. Non-Bunk. U-Shaped Dinette, Outside Kitchen. Russet Interior Decor. 1/2 Ton Towable at 5,407 lbs. Non-Bunk. U Shaped Dinette, Outside Kitchen. Harbor Interior Decor. Mid Size SUV Towable at 5072 lbs. Non-Bunk. Booth Dinette, Theater Seating IPO Jackknife Sofa. Harbor Interior Decor. 1/2 Ton Towable at 6,087 lbs. Non-Bunk. U Shaped Dinette, Rear Living, Tri-Fold Sleeper Sofa. Harbor Interior Decor. 1/2 Ton Towable at 6,001 lbs. Non-Bunk. 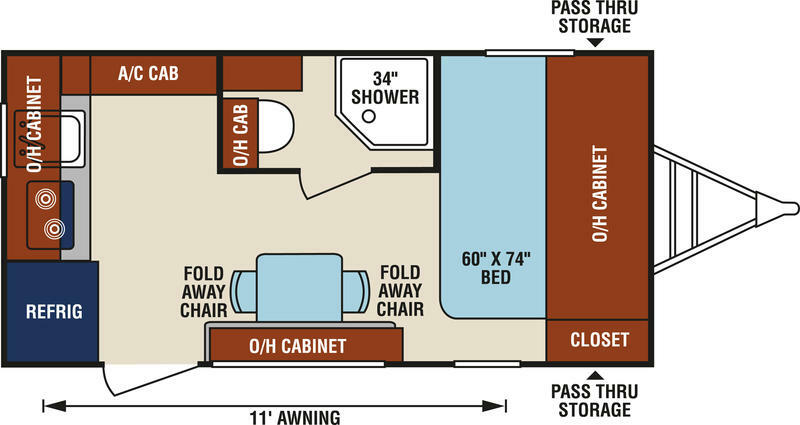 U Shaped Dinette, Rear Bunk Room, Tri-Fold Sleeper Sofa. Harbor Interior Decor. 1/2 Ton Towable at 7,243 lbs. Bunks. Rear U-Shaped Dinette, Front Queen. Lodge Interior Decor. Mid Size SUV Towable at 3310 lbs. Non-Bunk. Booth Dinette. Iron Interior Decor. Mid Size SUV Towable at 3,240 lbs. Non-Bunk. Booth Dinette, Front Queen Bed. Lodge Interior Decor. Mid Size SUV Towable at 4438 lbs. Non-Bunk. 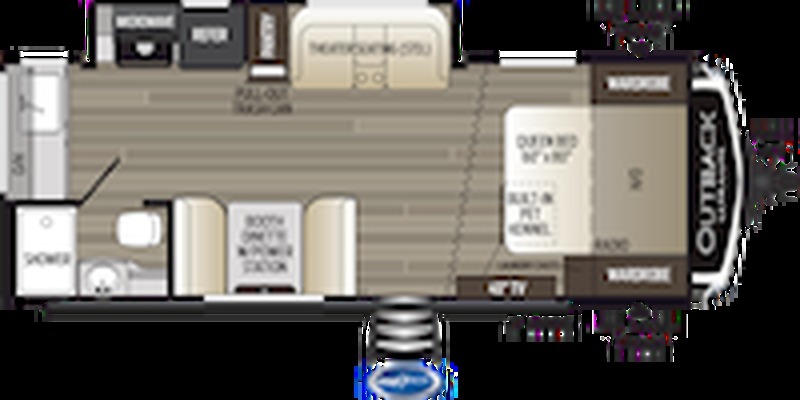 Booth Dinette, Bunks, Murphy Bed/Sofa. Cedar Interior Decor. Mid Size SUV Towable at 4,700 lbs. Bunks. U-Dinette, Bunks. Cedar Interior Decor. 1/2 Ton Towable at 5665 lbs. Bunks. Manufacturer's Discounts Extended! Booth Dinette, Rear Kitchen. Cedar Interior Decor. 1/2 Ton Towable at 6115 lbs. Non-Bunk. U-Shaped Dinette, Tri-Fold Sleeper Sofa. Cedar Interior Decor. 3/4 Ton Towable at 7860 lbs. Non-Bunk. Booth Dinette, Rear Bunks, Lodge Interior Decor. 1/2 Ton Towable at 6069 lbs. Bunks. Rear Bunks, Booth Dinette. Lodge Interior Decor. 1/2 Ton Towable at 6175 lbs. Bunks. U-Shaped Dinette, Queen Island Bed. Timber Interior Decor. 1/2 Ton Towable at 6,695lbs. Non-Bunk. Rear Kitchen, U-Shaped Dinette. Lodge Interior Decor. 1/2 Ton Towable at 6969 lbs. Non-Bunk. Rear Bunks, U-Shaped Dinette. Lodge Interior Decor. 1/2 Ton Towable. Bunks. Rear Bunk Room, U-Dinette. Timber Interior Decor. 3/4 Ton Towable at 9025 lbs. Bunks. Rear Living W/Opposing Slides, Free Standing Dinette and Chairs. Lodge Interior Decor. 1/2 Ton Towable at 7806 lbs. Non Bunk. Rear Bunk Room, Booth Dinette. Lodge Interior Decor. 1/2 Ton Towable at 7620 lbs. Bunks. 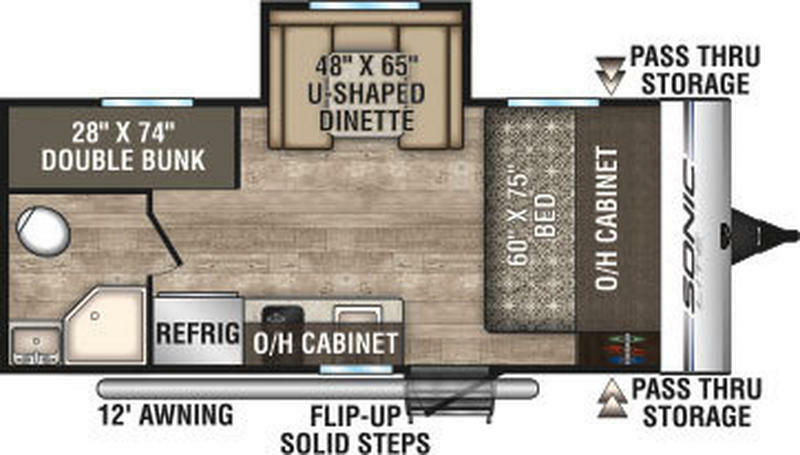 U-Shaped Dinette, Jackknife Sofa, Bunk Room. Lodge Interior Decor Interior. 1/2 Ton Towable at 7,890 lbs. Bunks. Rear Bunk Room, Booth Dinette. Lodge Interior Decor. 1/2 Ton Towable at 7985 lbs. Bunks. Rear Bunk Room, Booth Dinette. Lodge Interior Decor. 1/2 Ton Towable at 8310 lbs. Bunks. U-Shaped Dinette, Front Island Queen Bed. Cocoa Interior Decor. Mid Size SUV Towable at 4809 lbs. Non-Bunk. 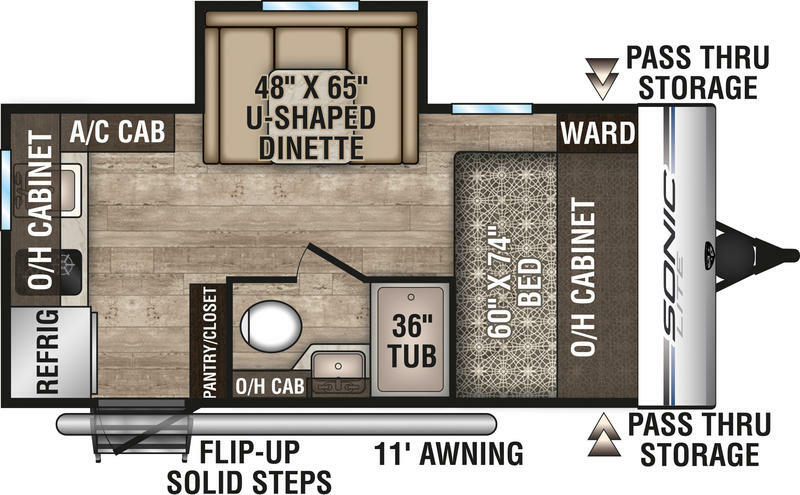 U Shaped Dinette, Murphy Bed over Sofa, Rear Bunks. Cocoa Interior Decor. 1/2 Ton Towable at 4,681 lbs. Bunks. U-Shaped Dinette, Front Queen and Rear Bunks. Cocoa Interior Decor. 1/2 Ton Towable at 5,462 lbs. Bunks. U-Shaped Dinette, Front Queen, Outside Kitchen. Cocoa Interior Decor. 1/2 Ton Towable at 6,000 lbs. Non-Bunk. U Shaped Dinette, Bunks. Shown in Cocoa Interior Decor. 1/2 Ton Towable at 6,368 lbs. Bunks. U-Shaped Dinette, Rear Living w/Opposing Slides. Cocoa Interior Decor. 1/2 Ton Towable at 7584 lbs. Non Bunk. Booth Dinette, Rear Bunks. Java Interior Decor. 1/2 Ton Towable at 7,745 lbs. Bunks. U-Shaped Dinette, Theater Seating. Java Interior Decor. 1/2 Ton Towable at 5,322 lbs. Non-Bunk. U-Shaped Dinette, Rear Kitchen. Java Interior Decor. 1/2 Ton Towable at 5,900 lbs. Non-Bunk. U-Shaped Dinette, Theater Seating. Java Interior Decor. 1/2 Ton Towable at 7360 lbs. Non-Bunk. Booth Dinette, Rear Living w/Opposing Slides. Java Interior Decor. 1/2 Ton Towable at 7,840 lbs. Non-Bunk. Mid Living, Booth Dinette. Patina Interior Decor. 1/2 Ton Towable at 4935 lbs. Non-Bunk. Rear Kitchen, Free Standing Dinette and Chairs. Patina Interior Decor. 1/2 Ton Towable at 5605 lbs. Non-Bunk. Booth Dinette, Tri-Fold Sleeper Sofa. Patina Interior Decor. Half Ton Towable at 6,655 lbs. Non-Bunk. Mid Living, Free Standing Dinette w/Power Station. Patina Interior Decor. 1/2 Ton Towable at 5980 lbs. Non-Bunk. Booth Dinette, Happy Jack Electric Bunk Beds. Patina Interior Decor. 1/2 Ton Towable at 6,065 lbs. Bunks. Rear Kitchen, Free Standing Dinette W/Power Station. Patina Interior Decor. Non-Bunk. Rear Bunk Room, Booth Dinette W/Power Station. Patina Interior Decor. 1/2 Ton Towable at 7090 lbs. Bunks. Booth Dinette Bunks, Outside Kitchen. Patina Interior Decor. 1/2 Ton Towable at 6,675lbs. Bunks. Booth Dinette, Rear Bunk Room. Patina Interior Decor. 1/2 Ton Towable at 8,428 lbs. Bunks. Free Standing Dinette, Rear Living. Patina Interior Decor. 1/2 Ton Towable at 8 615 lbs. Non-Bunk. Rear Bunk Room, Booth Dinette W/Power Station. Patina Interior Decor. 1/2 Ton Towable at 8680 lbs. Bunks. Rear Living W/Opposing Slides, Corner Dinette. Patina Interior Decor. Non-Bunk. U-Shaped Dinette, Queen Bed. Starlight Interior Decor. SUV/Mini Van Towable at 2756lbs. Non-Bunk. Front Queen Bed, Booth Dinette. Starlight Interior Decor. SUV/Mini Van Towable at 2662 lbs. Non-Bunk. Rear U-Shaped Dinette, Front Queen Bed. Starlight Interior Decor. SUV/Mini Van Towable at 2785 lbs. Non-Bunk. Rear U-Shaped Dinette, Front Twin Beds. Starlight Interior Decor. SUV/Mini Van Towable at 2626 lbs. Non-Bunk, Bunks. U-Shaped Dinette, Front Queen Bed. Sandbar Decor. Mid Size SUV Towable at 3350lbs. Non Bunk. Rear Living, Double Loft Area Above Bedroom and Bathroom. Ozark Interior Decor. 1 Ton Towable. Bunks, Non-Bunk. Free Standing Dinette, Loft over Bedroom. Bistro Interior Decor. 1 Ton Towable at 12,141 lbs. Bunks. Rear Kitchen, Table with Fold Away Chairs. Black Diamond Interior Decor. Mini Van and SUV Towable at 2,745 lbs. Non-Bunk. U Shaped Dinette, Rear Kitchen. Granite Interior Decor. SUV and 1/2 Ton Towable at 2898 lbs. Non-Bunk. U-Shaped Dinette, Front Bed. Granite Interior Decor. Mini Van and SUV Towable at 3335 lbs. Non-Bunk. Booth Dinette, Front Queen Bed. Coffee Interior Decor. Mini Van and SUV Towable at 3,376 lbs. Non-Bunk. U Shaped Dinette, Rear Bunks. Granite Interior Decor. Mini Van and SUV Towable at 3,340lbs. Bunks. Booth Dinette, Front Murphy Bed over Sofa. Shown in Granite Interior Decor. 1/2 Ton and Some SUV Towable at 3320 lbs. Non-Bunk. Jiffy Sofa w/Table, Front Island Murphy Bed. Granite Interior Decor. 1/2 Ton and Some SUV Towable at 4,040 lbs. Non-Bunk. 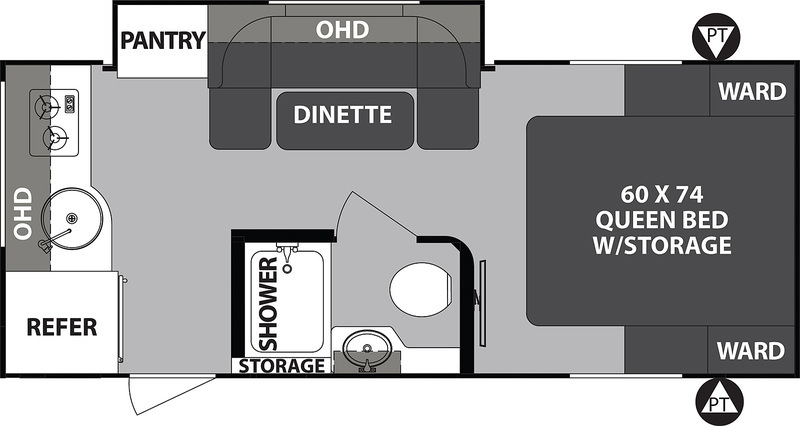 U-Dinette, Queen Bed, Outside Kitchen. Coffee Interior Decor. 1/2 Ton Towable at 4,460 lbs. Non-Bunk. U-Shaped Dinette, Jiffy Sofa. Latte Interior Decor. 1/2 Ton and Some SUV Towable at 4,340 lbs. Non-Bunk. 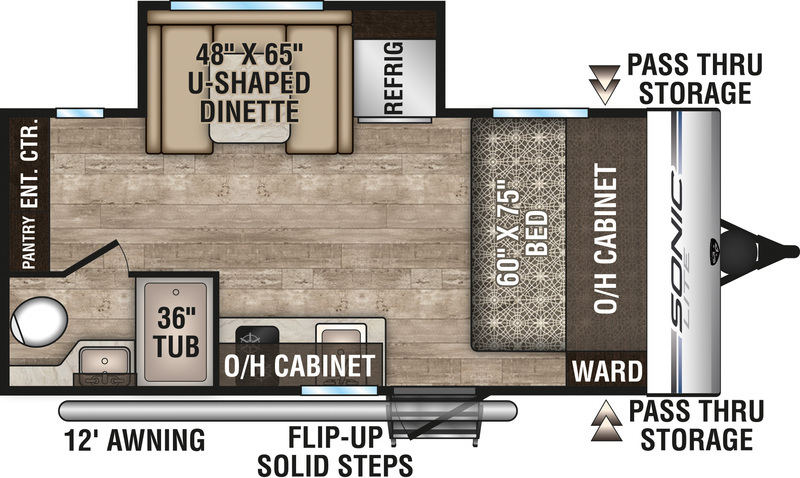 U-Shaped Dinette, Rear Bunks, Queen Bed. Latte Interior Decor. 1/2 Ton Towable at 5,190 lbs. Bunks. Booth Dinette, Theater Seating. Coffee Interior Decor. 1/2 Ton Towable at 5,940 lbs. Non-Bunk. Large U-Shaped Dinette, Theater Seating. Coffee Interior Decor. 1/2 Ton Towable at 5940 lbs. Non-Bunk. Rear Bunks, Booth Dinette, Tri-Fold Sleeper Sofa. Granite Interior Decor. 1/2 Ton Towable at 5460 lbs. Bunks. Booth Dinette, Outside Kitchen. Granite Interior Decor. 1/2 Ton Towable at 6,440lbs. Non-Bunk. Rear Kitchen W/Opposing Slides. Booth Dinette. Granite Interior Decor. 1/2 Ton Towable at 7260 lbs. Non-Bunk. Rear Kitchen, Free Standing Dinette w/Chairs, Front Window. Granite Decor. 1/2 Ton Towable at 8570lbs. Non-Bunk. Free Standing Dinette, Front Kitchen w/Windshield. Granite Interior Decor. 1/2 Ton Towable at 8,780 lbs. Non-Bunk. Rear Living w/Opposing Slides, Free Standing Dinette. Granite Interior Decor. 1/2 Ton Towable at 8150 lbs. Non-Bunk. 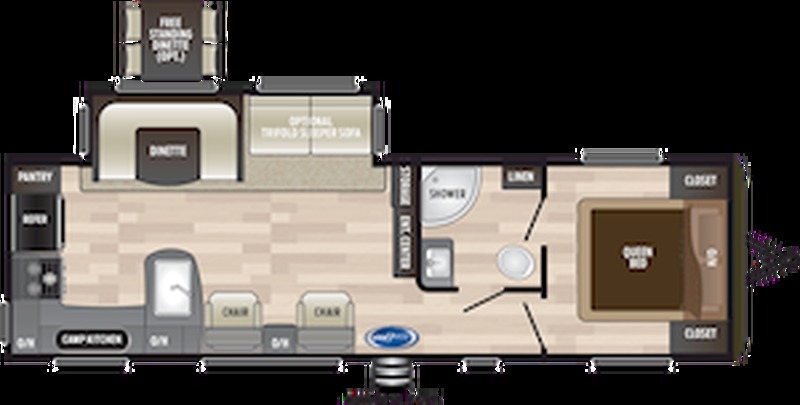 NEW TO LARDNERS - STRATUS BY VENTURE RV. Coco Interior Decor. 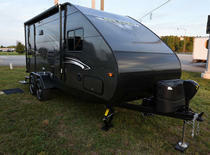 1/2 Ton Towable. Non-Bunk.